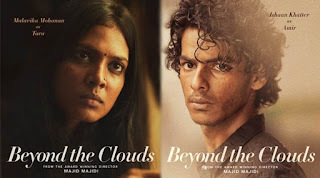 The cute actor Ishaan Khatter and talented actress Malavika Mohanan along with famous Iranian director Majid Majidi were in Nation's capital for the promotion of their film Beyond the Clouds. They were witnessed interacting with media and sharing their views in the press conference held in Hotel Shangri-La at Ashoka Road. The entire team seemed enthusiastic and confident about their film which is set to release in India on April 20, 2018. While talking to media, and asked about the cast of the film Director Majid Majidi stated, "I was really happy that I have worked with two talented people, they were more than my expectations. Both of them are coming from cinema family but I did not know that. And I choose them on the basis of their talent. And I am sure both of them are going to shine not just in Indian cinema but in a global cinema as well." When asked about from where he gets the idea of this film he said, "Since always I take my stories from society here is the same thing during this visits. I got some ideas & these ideas turned into a film. This movie talks about the human values, humanity, and the importance of family." Well, the unique part of this film is that it’s the first Hindi film of director Majid Majidi. Whereas, on the other hand, Ishaan stated about being a part of this film, he said, "It was a great experience to be a part of world cinema there was a moment when it was emotionally draining but at the same time it was really pathetic. One can also feel lighter after performing some nice scenes but the preparation for the scenes in this film was more draining than performing them." Further, he added, "It's very encouraging & inspiring that I am a part of Majid Majidi Sir's first Hindi film." Featured under the banner of Zee Studios, Beyond the Clouds is a 2018 Indian drama film written and directed by Majid Majidi and an original score composed by A. R. Rahman. The film stars Ishaan Khatter and Malavika Mohanan in the lead roles. The film story is centered on a brother-sister relationship. Further, it focuses on the siblings' bond, on human relationships in general. The film is a grown-up version of Majidi's previously directly Children of Heaven (1997) set in Mumbai. The film premiered at the 2017 BFI London Film Festival and set to release in India on April 20, 2018.